The Columbus Blue Jackets Learn to Play program returns for 2019! Part of a National Hockey League-wide initiative in partnership with the National Hockey League Players' Association, Blue Jackets Learn to Play program will provide first time participants*, between 5-8 years of age, free head-to-toe equipment, age appropriate instruction and certified coaching, led by Blue Jackets Alum Andrew Cassels, in a fun and safe atmosphere. The program will consist of six (6) 50 minute long on-ice sessions over the course of six (6) consecutive weeks. *This introductory program is designed as a next step for kids that can already skate on their own, but have not yet participated in any learn to play hockey or organized hockey programs. Learning to play hockey is more than just learning a game. More than skating, passing and stick-handling, hockey is about responsibility, respect and teamwork. As children learn the skills needed to succeed on the ice, they also build and solidify important character traits needed to succeed off the ice. Developed with the help of experts from USA Hockey and Hockey Canada, the Blue Jackets Learn to Play initiative aims to be the gold standard for youth hockey programs with the goal of inspiring more families to join the hockey community. Please click and carefully review all the information in this section prior to registering your child. To be eligible for the Blue Jackets Learn to Play program children must be between 5-8 years of age and new to hockey. Children who are currently or previously enrolled in a learn to play program or play/played organized hockey are not eligible to participate in this program. ANY PLAYER WHO IS FOUND NOT TO MEET THESE REQUIREMENTS WILL BE REMOVED FROM THE PROGRAM WITHOUT REFUND. Skating lessons are highly recommended and required before children attend their first Blue Jackets Learn to Play class. Participants must be able to skate fluently on their own in hockey skates (no marching). This is typically achieved upon completion of a Basic 2, Hockey Prep and or Stinger 2 class. Learn more about skating classes at www.thechiller.com. If your child has never participated in a skating class but wants to try hockey, the Blue Jackets GOAL! program presented by Performance Columbus is a great way to experience hockey without the cost of equipment. Once equipment is received there will be no refunds for the program. The Blue Jackets Learn to Play program is a one-time participation program. Children may not repeat the program as to allow new kids to try out the sport. Participants must register online, no exceptions. There are limited spaces available on a first-come, first-served basis. If the session you prefer is full, please check another session before signing up for the waitlist. Registered participants will be required to attend an equipment fitting at a specified Chiller location 1-2 weeks prior to the first on-ice session. Registration is confirmed with an email upon completion of online registration. If you did not receive an email confirmation, please contact learntoplay@bluejackets.com. Upon completion of the Blue Jackets Learn to Play program parents will be provided with 'next step' opportunities for their child's further development. All participants will automatically be registered with USA Hockey for the 2019-2020 season allowing for an easier and less expensive transition into future hockey programs. 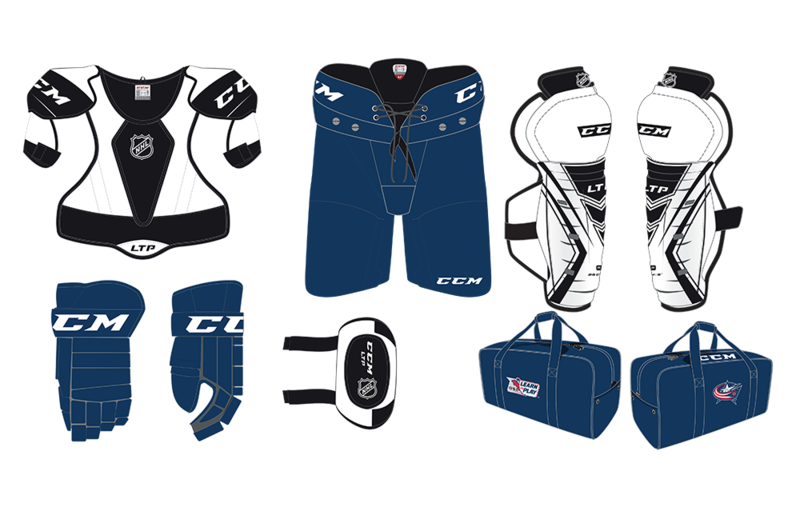 Open to first-time participants new to hockey, the Blue Jackets Learn to Play program provides free head-to-toe equipment to boys and girls between 5-8 years of age in an effort to reduce cost barriers associated with an introductory program. Each participant will receive the following to keep: helmet, shoulder pads, elbow pads, gloves, pants, shin pads, socks, skates, jersey, stick, and equipment bag. Does your child want to play hockey but does not meet the age requirements for the Blue Jackets Learn to Play program? The OhioHealth Chiller Ice Rinks offer skating and hockey classes for ages 3 and up, and may be able to help you find quality used gear from an equipment bank if needed. Learn more at www.thechiller.com or www.ntprdchiller.com. CANCELLATIONS: We understand that situations occur that may prevent you from participating in Blue Jackets Learn to Play program. If you need to cancel your registration, please contact learntoplay@bluejackets.com with your request. Once equipment is received there will be no refunds for the program. The Blue Jackets Learn to Play program is a one-time participation program. Children may not repeat the program as to allow new kids to try out the sport. For additional assistance, please email learntoplay@bluejackets.com.